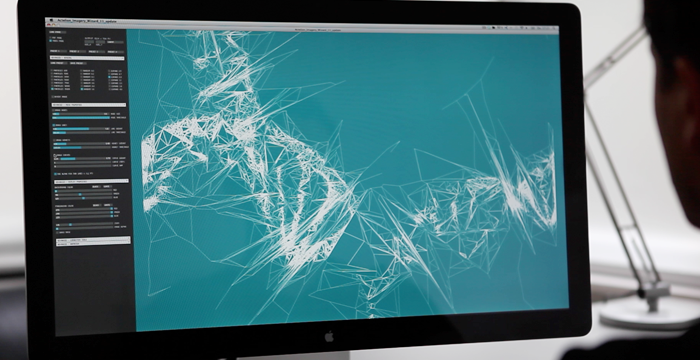 The project is the work of onformative, a design house uniquely dedicated to generative graphics. For the rebranding of Actelion, a biopharmaceutical company, we developed a tool for automatic image generation that enables the generation of a unique, in-itself homogeneous graphic image world out of heterogeneous visual material. “Create a new identity for our brand Actelion. Don’t touch the logo, but create something the world of pharma has not seen before.” Based on the idea “From medical industry to medical magic,” a new image was developed that rendered medicine’s invisible magical moment visible. Here, the new imagery is based on the smallest possible unit: digital molecules. These capture the magical moment when new medicine arises from molecules; innovative design for a company that supplies the world with innovations. We worked closely together with Interbrand in creating the graphic imagery and developed a software, that enables the targeted creation of graphic images based on photographs, whose visual information contained in the tool is translated into graphic elements such as points, lines and curves using special algorithms. Thanks to magician and technologist Marco Tempest for the tip!